The Event Request Forms your organization uses can be customized according to what each site needs. *Note: The Customizable Event Form is a new feature that will need to be activated in your account. For more information about the form, contact Client Services. Click on Event Request Forms under Advanced Settings. Click on the Create a Form button. Create New: Create a brand new event form from scratch. Copy From Existing: Use an existing event form as a starting point and make any changes needed before saving. Enter a name for the event form, then click Get Started. Click on the Form Settings button to make customizations to the Form Header, Thank You Message, and Logo for this event form. If you copied an existing event form, all components that were included on that form will show on the screen. 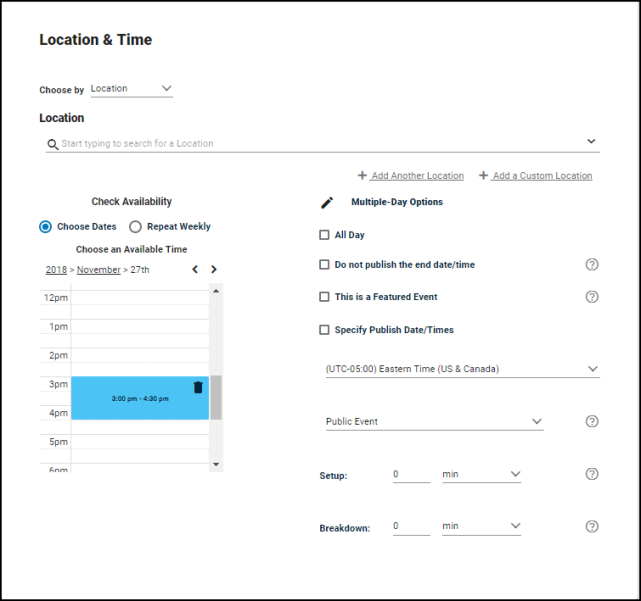 If you chose to create a new event form, only the required components of Event Details and Location & Time will show here. To add a new component to the form, click on the component in the list to the left and drag it to the appropriate place on the event form. This is a required component on any event form. Event Name and Summary are required fields by default. This is a required component on any event form. The user can choose to search by location, or search by the date and time needed. This allows users to apply a Category or Keyword to the event, which will help people search for the event. Any questions that have been created for each site will show here. This component allows a user to enter information for the point of contact for an event. If this component is included on the event form, a user can add an image or another type of attachment to the event. This component allows a user to attach a sale item or registration to the event. This will allow a user to attach a survey to the event. They can select the specific survey as well as determine when the survey should be active. This will allow a user to add tasks to the event. They will be able to define the details of the task, such as the task type, who it is assigned to, and when it needs to be completed. The components can be reordered or removed from the form by hovering over the component and selecting Drag or Remove. Click Save to add this event form to the list of forms. *Note: For this form to be used at a particular site, it must be assigned to the site from the Event Request Forms list. The Event Request Forms page displays any event forms that have been created. Assign: Click here to assign this event form to the appropriate sites. View: Click here to view the public facing event form. Edit: Click here to edit the event form. The System Default Form is not editable, but any form that has been added to your account can be edited at any time. Archive: Archiving an event form will remove it from this event form list, make it unavailable for use, and remove it from the list of event forms available to copy when creating a new event form. To access archived event forms, click the View Archived Forms link at the top of the event forms list. An archived form can be restored at any time.